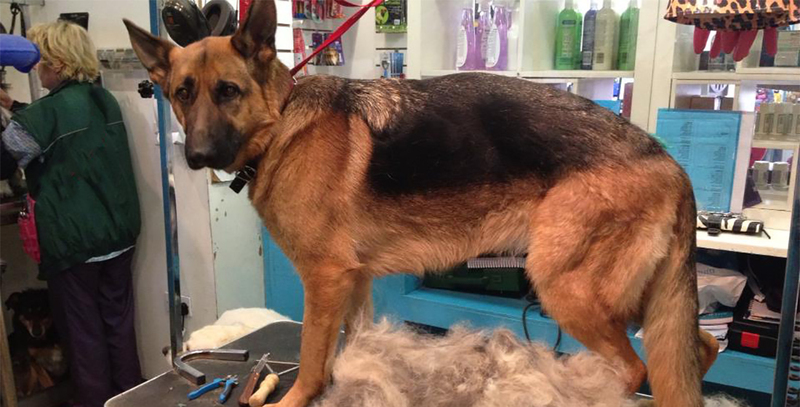 How to Groom your pure German shepherd ? HomeHow to Groom your pure German shepherd ? Grooming your purebred German shepherd puppies or an adult pure German shepherd is not just always about taking him for bathing. Grooming means taking care of the physical appearance of your German shepherd like how he looks, how to make his physical appearance impressive. So, in this blog, we mentioned some of the tips which help in the grooming of your dogs. And we also included some tips to maintain an impressive physical appearance of your dog. We know that a German shepherd has a double layered coat with heavy fur on his body that’s why he requires a lot of grooming. You have to brush his fur at least 3 to 4 times a week to make his fur shiny. You should brush his upper coat throughout the year and undercoat twice in a year. The most common problem which German shepherd owner face is the long hairs which got stuck in the vacuum cleaner. You have to take your German shepherd to a regular visit of veterinary to have teeth cleaning process. Teeth of German shepherd need to be cleaned or checked frequently because the food they eat will develop tartar and plaque in their gums. So, to avoid this you have to clean his teeth regularly. If you left the toenails of your purebred German shepherd to grow long this will leads to having injuries. You have to check the toenail of your puppy and trim its toenails regularly. If you have any issue in trimming his toenail and take it to the pet groomer. If you trimming his nail then you have to ensure that does not cut the toenail deeply, he will get injured after trimming his toenail apply some antiseptic powder on it. You should clean the ears of your German shepherd by removing the excessive wax and debris present in his ears. Use a soft cotton pad so remove wax and after cleaning his ears apply some cream to avoid rashes and dryness. You do not give him excessive bathing because it is not suitable for his body. Excessive bathing may create dryness and irritation on his so, give him the bath once in a month after some training sessions. Grooming is not as easy as it seems to be, but it is not as difficult if you want to make an impressive physical appearance of your German shepherd. You have to take care of him with these tips to groom him. Whenever you buy German shepherd maintain his physical health and appearance because it is your duty as an owner.